This European Standard specifies requirements and test methods applicable to materials and seams of protective clothing against the influence of precipitation (e. g. rain, snowflakes), fog and ground humidity. The testing of rain proofness of ready made garments is excluded in this standard at this time because a separate test method for such a property is currently being prepared. ROOTS Stormbuster, the pinnacle of waterproof FR workwear. 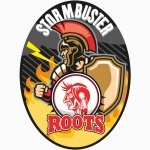 The Stormbuster range is divided into three variations, Stormbuster, Stormbuster Xtreme and Stormbuster Invincible, offering a complete package of the best of the best in FR and Arc rated waterproof workwear.